*Updated 2/1/2015 - Now includes 3 versions of student follow-along worksheet (one for each round) and a "No Answers" version in PDF form so students can use the file as an assessment at computer or iPad/tablet centers. There’s a new nuisance in town, and his name is Treblemaker. He’s stolen all the A’s, B’s, C’s, D’s, E’s, F’s, & G’s across the city. 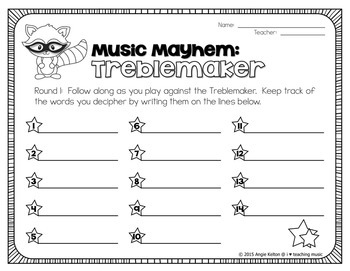 None of the shop keepers can sell their items, no one can read any of the street signs, and kids at Melody Elementary are unable to learn until Treblemaker has been apprehended. 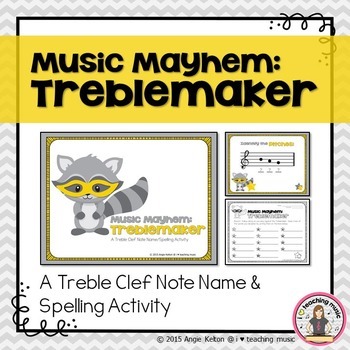 Help round up Treblemaker by correctly reading notes on the treble clef staff. PowerPoint file included is set up in game format with 3 rounds to choose from (words progressively get longer). "No Answers" version in PDF form also included so students can use the file as an assessment at computer or iPad/tablet centers. 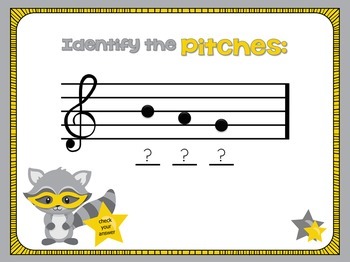 *All i ♥ teaching music files come with a teacher's guide that includes a student learning objective, "I can..." statements, and an essential question. I would love to hear suggestions for other items you'd like to see included in the file. Don't forget to leave feedback! Want to earn free products on TPT and make a seller's day? Feedback means a lot to sellers on TPT - we want to hear how useful our products are in your classroom and what needs we can fulfill. Don't forget to leave feedback on items you've purchased - you earn 1 TPT credit for every dollar spent on TPT. These credits can be used to purchase future items. Log in, go to "My Purchases" and click on the "Provide Feedback" link next to each product - it's that easy! Like what you see? 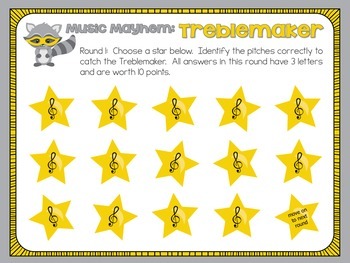 Click the little green "Follow Me" star above to follow i ♥ teaching music on TPT.